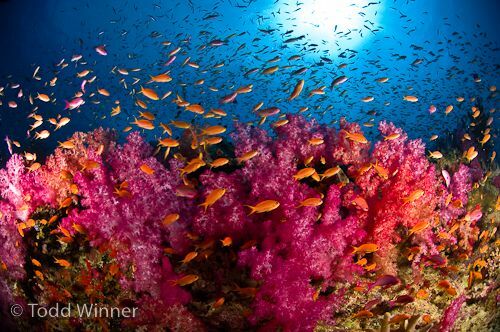 Fiji is especially beautiful under the water. In fact, we think it’s prettier than anywhere else in the world. And for anyone who enjoys scuba diving, visiting Fiji has to be on the bucket list as the country is known for some of the world’s best diving. Nicknamed the “Soft Coral Capital of the World” by famous oceanographic explorer Jean-Michel Cousteau, Fiji will not disappoint any level of diver as there are so many locations with varying degrees of difficulty and different types of marine life to see with great visibility. Seasoned divers know that Fiji is the place to go to see soft corals. You’ll see colorful soft and hard corals that resemble flower gardens, canyon-like terrain, caves, grottoes, diverse marine life (bull sharks, tuna, turtles, multi-hued fish), majestic reefs, technicolor critters, and basically every color of the rainbow. There is plenty to keep you busy under the water! Since there are so many options, we’ve dedicated two articles on this topic to make sure you find the right areas to dive. Today we will discuss diving conditions and diving on Fiji’s main island of Viti Levu, the Mamanucas, and the Yasawas. Next week, we’ll focus on the diving areas in Taveuni, Lomaiviti Group and Bligh Water, Kadavu, and Vanua Levu. And next week, we’ll also rank the top diving spots. Fiji is a great spot for diving year-round, but the very best season is from April to October because the other months may see greater rainfall, thus slightly decreasing visibility under the water. Water temperatures range from 73 degrees Fahrenheit to 84 degrees Fahrenheit in January making the water comfortable. Many dive with a thin wetsuit to remain most comfortable, but it’s doable without one too. Many travelers to Fiji start off on the main island, as there’s a fair bit of diving there. The best areas are off of Nananu-i-Ra to the north and to see the sharks in Beqa Lagoon to the south. Beqa Lagoon has soft corals, especially at Frigate Passage, where they seem to just fall freely over one another. The lagoon has bommies and pinnacles, and a good variety of marine life, which are great for beginner divers or those with less time on their hands. There are also some interesting options off Toberua Island and Navula Passage. The main island is most known for the shark diving in Beqa Lagoon. It’s truly a once-in-a-lifetime opportunity. Dive masters lure tiger sharks, bull sharks, and other sharks by feeding them in these exciting dives off southern Viti Levu near Pacific Harbour. (Clearly, this is a dive not for beginners.) If you are not interested in seeing the sharks but still want to go to Beqa, there are some fabulous underwater scenery of tunnels and caves at Caesar’s Rock. The Mamanucas are the easiest group of islands to get to after landing in Nadi and therefore this is another popular area. You can either choose to stay on the main island and take a boat from Nadi or Latoka or stay in a resort in the Mamanucas. There are many sites great for less experienced divers with marine life, good visibility, and pretty topography. Two popular sites are Plantation Pinnacles for its deep-water rock towers and Sherwood Forest for its beautiful sea fans. Gotham City has several coral heads surrounded by many reef fish. The area of the Yasawas will be less-crowded with divers and give you a better chance to see more around less people. This chain of volcanic islands offers pristine reefs, excellent corals, and topside backdrops. Lekima’s Ledge has a stunning underwater cliff off Vawa Island and Paradise Wall is a wall dive off the western side of Yasawa Island. Sawa-i-Lau Island has some interesting caves. And as we mentioned in our Blue Lagoon story here, many resorts around the Yasawas offer diving in the Blue Lagoon, where you can re-live the movie and see lots of fish. Stay tuned next week for more of the best diving spots in Fiji near Kadavu, Taveuni, Lomaiviti Group and Bligh Water, and Vanua Levu.